Most people are familiar with some of the ancient teachers from the Middle and Far East such as Lao Tzu, Confucius, Buddha, Jesus, and Mohammad but one of the greatest teachers most people have never heard of was Greek. I don't mean to overlook Plato, Aristotle or Socrates, but Epictetus really nailed it. 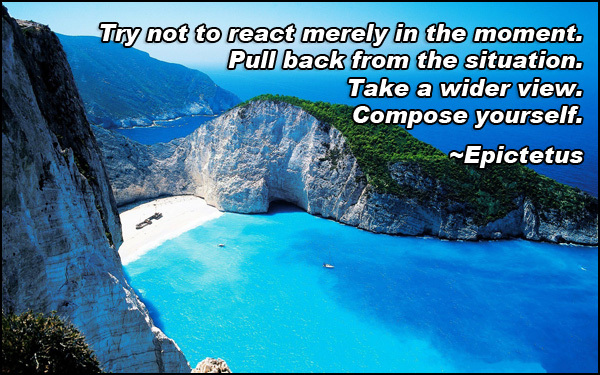 Epictetus (Epic-teet-us) was a Greek philosopher born in 55AD in what is now Turkey. He lived as a slave in Rome for most of his younger life. Although there are conflicting stories about how cruel his master was, almost all agree that he allowed Epictetus to attend classes in Rome with a famous philosopher named Musonius Rufus, a Roman senator and Stoic philosopher. From his exposure to Stoicism he began to develop and build upon his own philosophy that all human suffering comes from the struggle to control that which is outside of us or beyond our control. He taught that the only thing which you do have control over is your mind. In 89AD he and all philosophers in Rome at the time, were banished from Rome and moved to north western Greece. There he opened a school and eventually his teachings became famous throughout the ancient world. He continued teaching until his death in 135AD. Epictetus wrote mainly about personal freedom, personal integrity and self-control. His philosophy says that all suffering arises from trying to control that which is not controllable instead of focusing on the things you can control. You can only control your mind and thus your perception of things, in other words- detachment. Although he did not publish his own writings, his teachings were eventually published by his student Flavius Arrian and spread throughout the ancient world. I recently came across some of his sayings from The Handbook of Epictetus which was written over 1900 years ago. Ask yourself: Does this appearance (of events) concern the things that are within my own control or those that are not? If it concerns anything outside your control, train yourself not to worry about it. When something happens, the only thing in your power is your attitude toward it; you can either accept it or resent it. What really frightens and dismays us, is not external events themselves, but the way in which we think about them. It is not things that disturb us, but our interpretation of their significance. Don't demand or expect that events happen as you would wish them do. Accept events as they actually happen. That way, peace is possible. If you embrace these words and apply them in your daily life you can’t help but become lighter, happier and more peaceful.